When challenged to keep the polished leading edges of corporate aircraft shining brightly, International Aero Services team depend on POLISH to do this job. 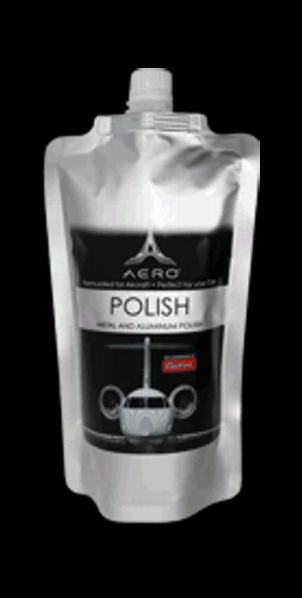 With certainty, this product will be the finest metal POLISH you will ever use. POLISH delivers shine and protection to aluminum, stainless steel, chrome, gold, silver, copper, brass and magnesium. Other paste-type polishes only permit small areas to be shinned at once. Their polishing products cannot be allowed to dry or they become difficult (if not impossible) to remove. But with POLISH, users can polish an entire surface, allow it to dry and simply dust it off. What’s left is a beautiful shine without the repetitive rub-on, wipe-off exercise required by other polishes. This product actually has certain proprietary ingredients that allow our POLISH to become finer and finer the more you rub it in. Essentially, you’re starting with a metal polish that begins with the necessary grade of compounds to remove oxidation and scratches that dull a metals surface, and as it’s used it breaks itself down to a finer and finer material until it becomes the finest level of polish available, leaving a shine and luster that would normally require you to use many different products to achieve this level of shine. Best of all, it’s effortless to use and once allowed to dry, it’s a simple “wipe off”.